Place this leather big chair in your living room, den, or any space that needs some extra style, sophistication and comfort. 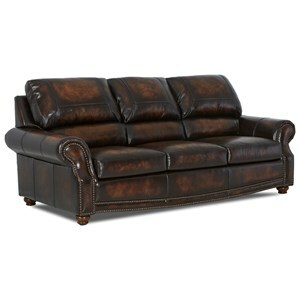 The piece features generously sized pub-back cushions paired with smoothly rolled arms for a comfortable look. Furthermore, nailhead trim runs down the arms and along the base to add some elegant detail that pairs brilliantly with the turned bun feet. Finally, choose between a set of custom, high-quality leathers to match your space and suit your personal style. The Foxfire Traditional Leather Big Chair with Nail Head Trim by Klaussner at Value City Furniture in the New Jersey, NJ, Staten Island, Hoboken area. Product availability may vary. Contact us for the most current availability on this product. The Foxfire collection is a great option if you are looking for Traditional furniture in the New Jersey, NJ, Staten Island, Hoboken area. Browse other items in the Foxfire collection from Value City Furniture in the New Jersey, NJ, Staten Island, Hoboken area.